This piece is dedicated to the former hot dog stand in front of Robarts. You will forever be in our hearts (and stomachs). Hot dogs are to students what gasoline is to cars; they provide energy and sustenance to keep you going throughout the day, but, like fossil fuels, you may want to think twice before putting them in your mouth. In keeping with this perhaps misguided automobile analogy, we spent Friday afternoon motoring our way down St. George Street, parking ourselves at each hot dog stand that crossed our path. Our goal? To partake in and review the St. George campus’ vast array of franks. We began by laying out the ground rules for our carnivorous quest. We would, at the first stand, ingest our own respective ‘furters, bedecking them with all the fixings we could conceivably fit on the bun. As the journey progressed, we would — in order to prevent our bellies from blowing — split each subsequent dog, ripping it down the middle King Solomon-style (shout out to applicable Biblical humour). We met our first hot dog with heart and determination — our stomachs were empty, and we were prepared to fill ourselves with meaty goodness. Located at the corner of Bloor and St. George, we both ordered an all-beef dog from Noori, the stand’s amiable owner, and waited a meager two minutes for the food to be ready. Conveniently, this was Noori’s first day on the job in this particular location, which meant he had been taking extra care to impress the customers. The end result was a finely cooked, succulent dog, piled with an infinite array of toppings, that thoroughly fulfilled our abdominal desires. Next, we made our way towards the stand in front of Sid Smith. Arriving at our second destination, we were met by Sani, the stand’s owner. We ordered another all-beef hot dog — this time with the intention of splitting it — and noticed another hot dog stand just down the road, located uncomfortably close to its competitor. Sani, however, seemed unfazed, and served us our alarmingly long frankfurter within minutes of ordering. Unfortunately, this hot dog was a tad overcooked, and the all-too-familiar black crust had begun festering at the top. We shoveled it down and made our way to the next stop, a little green around the edges. 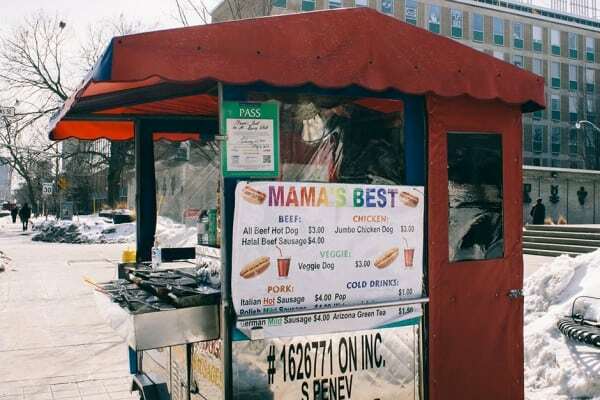 A stone’s throw away from our previous stop, this stand — curiously labeled “Mama’s Best,” despite the startling absence of a maternal presence — offered us the best dog of the day. Opting to change things up, we decided to gorge on a jumbo chicken dog, leaving our beefy roots well behind us. Stefan, the cart’s operator boasting eight years of hot dog stand experience, was bubbly and kind, and cooked up a hearty, delicious dog with a perfectly toasted bun. He even answered a question that had been nagging us since we embarked on our journey: where does the stand go at night? “I keep it in my garage,” he explained, with a mysterious glint in his eye. We left the stand full, but somewhat skeptical of this response: we’re on to you, Stefan. Our guts nearing maximum capacity, we opted to cap off the day with a deviation in form: a trip to the blue ruck outside of McLennan Physical Laboratories. We had had all that we could stand with stands. It instantly dawned on us that trucks are a lot less intimate than stands. Stefan had managed to create a rewarding customer experience simply by engaging us in pleasant conversation. But after taking our order at Blue Truck, the operator disappeared behind a veil of deep-fryers and stacked beverages. The pig-in-the-blanket we were given lacked soul and care; the pig tasted undercooked and sour, and the blanket started to crumble and flake as soon as it entered our hands. The bitter taste of a lacklustre hot dog in our mouths marked a glum end to an otherwise fulfilling (emphasis on the filling) day. While we would not suggest this Homeric quest to anyone who values their arteries, we do recommend the occasional campus dog. Hopefully you will consult this guide on your next trip to the hot dog stand, so that all of this gastrointestinal chaos hasn’t been in vain. For further questions, please call Toronto General Hospital.